With the swearing-in of President-elect Barack Obama just a week away, even foodies are getting in on Inauguration fever. From District-food gaffes to deciding not to decide on a new White House chef, every televised bite by the President-elect is fodder for the culinary media. The LA Times finds political irony in the Lincoln-themed Inaugural luncheon menu. There’s a blog devoted entirely to what Obama says about food, Obamafoodorama, and even a cheese named for the President-elect, the “Barick Obama” from Vermont’s Lazy Lady Farm. Naturally we thought we’d join the fray, and suggest some of America’s best “blue state” cheeses and brews for your Inaugural party. It has also come to our attention that Prairie Fruits Farm* goat cheese from the President-elect’s home state of Illinois will be served at the Inaugural feast – atop arugula perhaps? (Thanks to The Media Table for the tip.) While we enthusiatically support the promotion of America’s artisanal cheesemakers, we wanted to take a moment to note that Mr. Obama need not phone home whenever a craving for fine curds strikes. Elsewhere in the region, Virginia’s Everona Dairy produces some of the finest aged sheeps-milk cheese around; try the Cracked Pepper for extra zip. 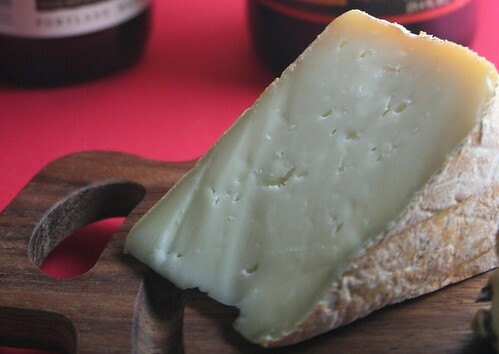 Meadow Creek Dairy‘s Grayson, a nutty washed-rind Jersey cows-milk cheese, took top prize in last year’s American Cheese Awards. Firefly, Everona and Meadow Creek cheeses are all available at local cheese shops, and the first lady and daughters could stroll up Connecticut Ave. to meet Everona’s Dr. Pat herself at the Dupont Circle FreshFarm Market. Of course, if they wanted to take the White House Organic Garden idea a little further, they could bring back a herd of sheep and make their own cheese … though I suspect they have more pressing items on their to do lists. 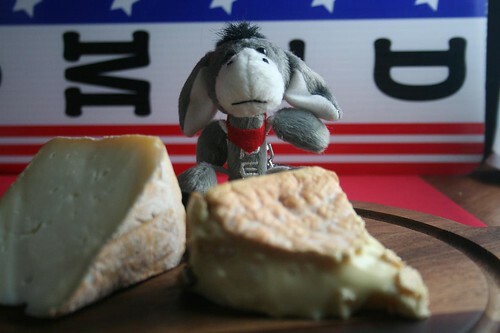 Check back each day this week for more Inaugural cheese picks, and let us know what you’ll be noshing on to celebrate! *Do read the story of Prairie Fruits Farm on their website; they are Illinois’ first farmstead cheesemakers and are creating a diverse, self-sustaining farm that also produces fruits, berries and grains. Unfortunately we couldn’t track down their cheeses here in DC or in Minneapolis, so if any readers come across it, do let us know what you think!